Papa a la Huancaina, one of the top traditional dishes of Perú! Papa a la Huancaina, one of the top traditional dishes of Peru! What is papa a la Huancaina? When it comes to food experiences, Perú is the best place in South America to visit. Perú is famous for its fine cuisine, and it is definitely one of the many reasons for many tourists to add this South American country to their bucket list. In addition, if you are looking forward to tasting one of the traditional dishes in Perú, papa a la Huancaina is a must! 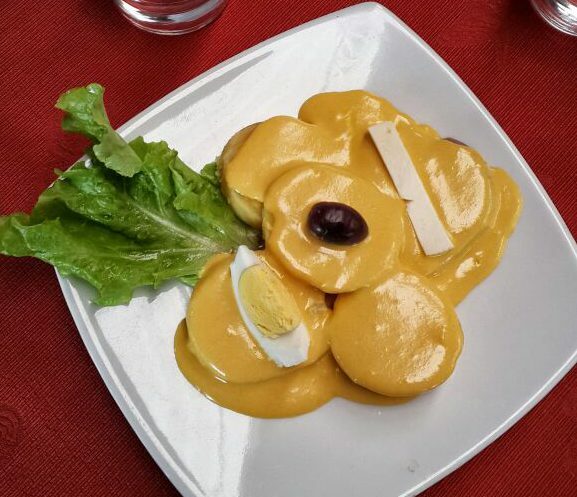 Papa a la Huancaina (potatoes Huancayo style), are cooked potatoes with a creamy delicious sauce (made of fresh cheese, oil, aji amarillo, evaporated milk and salt). Also, worth mentioning, they are accompanied by hard-boiled eggs and black olives. In order to make the huancaina sauce you should blend the aji amarillo paste together with oil, milk, crackers, fresh cheese and salt. Additionally, boil the potatoes and wash some lettuce leaves. Once you are ready to eat, serve the sauce on top of lettuce leaves and potato slices, then garnish with black olives and hard-boiled eggs. In conclusion, you should not leave South America withouth tasting this Peruvian tasty staple food. This is one of the dishes I enjoy ordering often in Peruvian restaurants or if visiting Peru. Do you want to taste papa a la Huancaina? Then you definitely need to add Perú to your bucket list! A great book with some of the most traditional dishes in Peruvian gastronomy, is The Food and Cooking of Peru: Traditions, Ingredients, Tastes and Techniques in 60 Classic Recipes by Flor Arcaya de Deliot. It is a well-written book with step-by-step visual instructions to some of the best recipes of Perú. If you would like to taste some Peruvian cuisine, this book is for you!